I'm still holding out hope that antitrust law will at least keep the John Mayer song ‘Gravity’ separate. Things still won't be unified until they get Google, Facebook and Twitter together. At which point, we're all screwed. Third-world countries are defined as those that use SECAM. Didn't The End of Evangelion give us the answer to this? da Doctah wrote: Third-world countries are defined as those that use SECAM. I have doubts about much of the NTSC world, too. If actual gravity worked the way it does in Alfonso Cuarón's Gravity you could unify them all easily. Just make it up as you go along. Perhaps some day North Korea / South Korea also ? 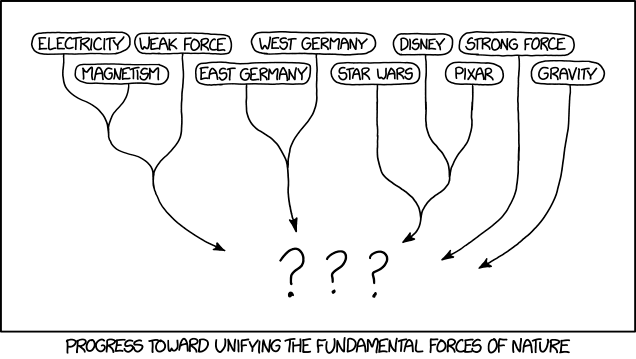 If this implies that the strong nuclear Force is going to capture the Disney-era Star Wars franchise and crush it to a singularity, then bring it on. Should have had "Vulcan" and "Romulan" blobs on the chart. JudeMorrigan wrote: Should have had "Vulcan" and "Romulan" blobs on the chart. to put those blobs onto the chart, use some gluons to make them ... Klingon. The paradigm shift that happened with the unification of smilies, emojis and unicode is not to be underestimated either. I'm surprised that no one mentioned that Pixar has its origins in Lucasfilm, becoming independent as Lucasfilm sold off stuff after Return of the Jedi. By all rights, Pixar should split off from Star Wars up at the top of the chart before merging with Disney! To add further confusion, the proto-Pixar group also did some work for Star Trek II: The Wrath of Khan. Someday civilization will look back at the halcyon days before the behemoths of AOL and Time Warner united to monopolize entertainment for generations. I was a bit disappointed that the West/East Germany union isn't shown merging into the EU. Of course, the timeline is a bit different from the others, since West Germany was in the EU before East Germany threw off their Soviet masters. So it's not clear how to draw the merging lines. I like that almost as much as my idea of making IHOP change their name to honor their real star breakfast: sausage, eggs, biscuits and gravy. Doesn't IHOSEBAG sound more like a place you'd like to eat? jc wrote: I was a bit disappointed that the West/East Germany union isn't shown merging into the EU. MakingProgress wrote: Perhaps some day North Korea / South Korea also ? Some of them may count as Fundamentalist forces. How can you put Disney on here without including Marvel and Fox? What about countries that switched from SÉCAM to PAL sometime in the nineties (only to later bin the whole analog terrestrial broadcasting in favor of DVB-T)? jc wrote: I was a bit disappointed that the West/East Germany union isn't shown merging into the EU. Of course, the timeline is a bit different from the others, since West Germany was in the EU before East Germany threw off their Soviet masters. So it's not clear how to draw the merging lines. Just wait until you see the results of the European Metaphorical Particle Accelerator's latest collision. We're testing the theory that an up e-µ will split into a down e-µ, a mu-Kaon (µK-) and a shower of charged rhetoric. This ground-breaking experiment may even break charge symmetry in that every part of the theorised products is negative. The overlords may save seconds, but the underlings would likely lose what is left of their free time.